here are many video on YouTube showing how to do things, but the problem is that most of them don’t have a transcript and captions.You can create Captions or Sub Titles to any YouTube Videos online at CaptionTube, which is free online webtool powered by Google App Engine. CaptionTube provides a scaleable timeline. You can also make changes to captions and preview them immediately.You can import your YouTube Videos from your account into CaptionTube and create captions for your videos. Incase you don’t have a YouTube account you can still import the video into CaptionTube by providing the YouTube Video URL and export the Captions, Email the captions or Copy-Paste the captions in YouTube video’s. Offer viewers a transcript to read. Create and edit closed captions in multiple languages. Export captions and upload them to your YouTube account. No need of new signup, You can use your Google ID. 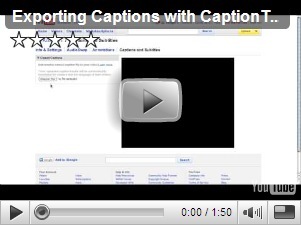 Create Captions for your videos at CaptionTube, If you have any doubt check out their HELP section.